Approximately 825 people came out to Old Fort Niagara on Saturday night, helping make Rochester Institute of Technology’s 33rd Big Shot photograph a picturesque success. 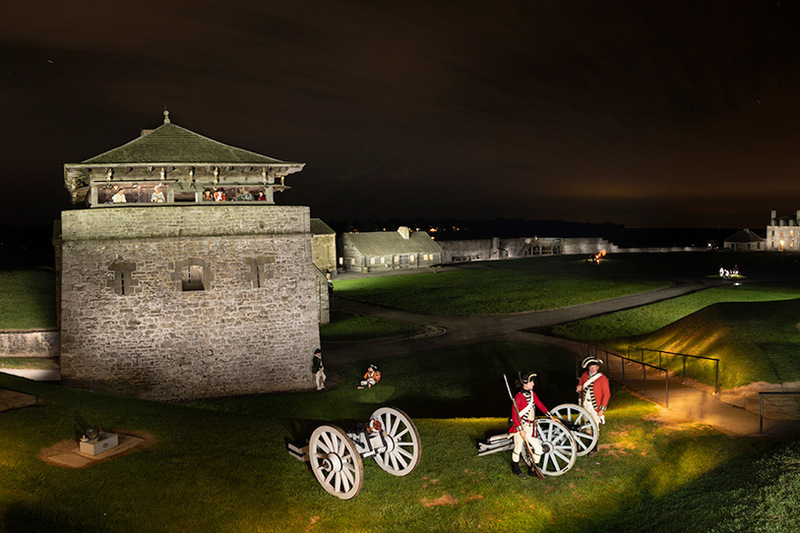 The opportunity to “paint light” on a historic fortress drew hundreds of people to Old Fort Niagara on a crisp fall Saturday night, helping make the Rochester Institute of Technology’s nighttime Big Shot photograph a picturesque success. Approximately 825 volunteers, including 72 RIT students who traveled to the Canadian border from the Henrietta, N.Y., campus, and more than 100 alumni, provided the primary light source for the Big Shot image while RIT photographers shot an extended exposure with Old Fort Niagara nearly completely darkened. This year’s final image was a 90-second exposure at f16 (ISO 100), taken by six Nikon D850 cameras with 20mm lenses. Using six cameras enabled the computational photograph to appear more proportional, closer to how the scene would appear to the eye. To give the photo a vintage look, the RIT photo team captured a firing cannon as a dozen reenactors—comprising a combination of fort staff and volunteers, including several from the Niagara Artillery—dressed in historic clothing for the compelling photo. The fort includes the six oldest buildings in the entire Great Lakes region and serves as Western New York’s only tangible link to the Revolutionary War period. Kunsman led the event with 16 colleagues from SPAS, among other staff, and 25 RIT photography students. He noted that capturing the final image culminated months of hard work and close collaboration between RIT and Old Fort Niagara, together with event sponsors Nikon Inc., Profoto and Eastman Kodak Co. The Big Shot often is described as “painting with light” because participants are asked to “paint” or shine their light source onto a particular area of a landmark while the photograph is taken. Participants were tasked with continuously “painting with light” their assigned areas of Old Fort Niagara while RIT photographers shot an extended exposure. As is tradition, the photo team took four timed exposures before capturing the final image around 8:45 p.m. The night temperature was 51 degrees. Since RIT started its Big Shot project in 1987, university photographers have captured such landmarks as Kodak Tower in Rochester, N.Y.; AT&T Stadium (formerly Cowboys Stadium) in Arlington, Texas; Churchill Downs in Louisville, Ky; and the Royal Palace in Stockholm, Sweden. Volunteers for the free, public event received directions on how they could download a digital copy of the finished photo, courtesy of Kodak. RIT’s Big Shot event began as a way to teach students about flash photography. RIT’s School of Photographic Arts and Sciences is nationally recognized for its degree programs. To view the photo and images of all Big Shot subjects, go to http://bigshot.cad.rit.edu/.